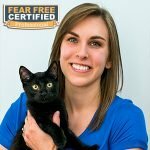 Katie joined the Weare Animal Hospital team after graduation from Eastern Florida State College in December of 2015 with an Associate’s Degree in Veterinary Technology. In the spring of 2016, Katie sat for the national exam and obtained her certification. Katie grew up in Goffstown and after attending college in Florida, she knew New England was the place she would always call home. Katie enjoys the hard work that is associated with being a veterinary technician and considers it a privilege to be able to help alleviate any pain, illness or discomfort of the patients she works with. Though she loves every part of her work, Katie has found herself drawn to the surgical field and the excitement that surrounds it. In her free time Katie enjoys snowboarding, hiking, horseback riding, and reading. She resides in Goffstown with her sassy and spunky cats Oreo and Calvin. Katie looks forward to marrying her fiancé next summer and filling their future home with pets.